As all of us know that, Microsoft has removed the Start Menu completely from the latest Windows 8 Consumer Preview. 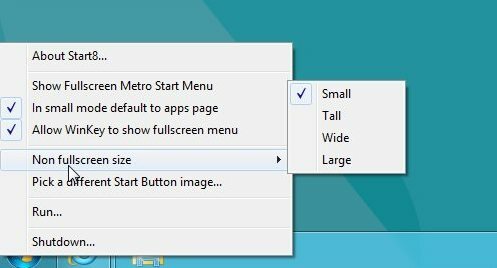 If you are really missing the Start menu button from the Windows 8, today here we let you know how to get back the Start menu in Windows 8. Recently Stardock releases the new free app called Start8, which allows you to get back the start menu on your Windows 8 pc. It Adds a “Start” menu to the Windows 8 taskbar and enables quick access and searching of your installed applications. It has lots of new feature for your windows 8 taskbar, installation is pretty simple. All you need is to install the Start8 app on your Windows 8 PC. After the installation you can see the new start button on bottom left corner of your Windows 8 Task bar. When you click on the Start Button you get the smaller version windows 8 Metro start, from here you can see all you apps that you installed on your PC or you can search the apps also. It has lots of option and feature which includes search to help you find system utilities, shortcuts to applications, metro apps, widgets and more. The apps section is scrollable, so you can easily find all your app at one place. You can also customize the start menu, by Right-clicking on the start menu you can change the Start menu icon, Adds Shutdown option and also select show full screen metro start screen. Personally, I feel that Start8 is one of the best and easy way to get back the old start menu on your windows 8, the app is totally free, just enter your email address and download the app and works on both both 32-bit and 64-bit versions of Windows 8.